Over the last 200 years the lush mountains of Western North Carolina, and especially the area surrounding the eastern section of the Highlands, Cashiers, and Lake Toxaway plateau, known as Lake Toxaway, has undergone amazing changes. Prior to the 1800’s this area was a part of early America with few white settlers. Combined with the Native American Indians Lands, trading paths were formed native to the Cherokee and Seneca Indians who moved from the flat lands of South Carolina, Georgia and Alabama in the winter to the cool elevations of the Southern Appalachian Mountains in the summer. Lake Toxaway as we know it today did not exist. Before 1895, this was a rugged mountain area, thick with forest. As the rail economy expanded, trains brought the lumber and mining industry to this area and provided access to the highly productive lumber and mineral lands special to this part of the world. These mountain forests provided an opportunity for lumber companies to cut and haul timber for fine lumber used for building, furniture making and tanning. In addition, after an 1874 U.S. Geological Mineral Survey noted large quantities of high grade gold copper, corundum and other valuable minerals, mining camps sprung up throughout the region. After the Civil War, mining operations flourished, and area lands were harvested of their bounty of virgin timber by the great lumber companies of the era .While there were no paved roadways to travel, the area was crisscrossed by an extensive rail and road system that allowed companies and workers access to these areas. As the mining and lumber companies gained access and discovered this area, the families of the owners of these logging and mining concerns soon followed. The railway company saw the benefit of combining the industrial use of the rail system with the growing demand by America for pristine vacation destinations that were available in the cool and clean areas of the Appalachian Mountains. The rail expansion eventually led to prominent families of the Northeast to migrate during the summer months to enjoy the beauty and pristine serenity of these special mountains. Thus, with the backing of The Southern Railway and a variety of industrialists principally from the industrial northeast, and in particular the Pittsburg area, a series of destination vacation Inns were constructed. This growth began in the late 1800’s from Asheville across Western North Carolina to Sapphire and eventually in the mid 1890’s to Toxaway. Much of this transformation is attributed to the dream E. H. Jennings, C.H. Stolzenbach, G.W. Eisenbeis, all Pittsburgh entrepreneurs, and other like J.F. Hayes, E.C. Wilson and E.B.Alsop and a host of others who visited the area in the late 1880’s and 1890’s. In the mid 1890’s, a group of visionary’s like, Jennings, Alsop, Stolzenbach, Hays, and others created and founded the Toxaway Company along with several resorts and Inns. Among them was the grandest inn of them all, The Toxaway Inn and the body of water known as Lake Toxaway. The Toxaway Inn was built on the shore of Lake Toxaway, the first artificial lake of any size built in the Appalachians. At three miles long, one mile wide and with a shoreline of 14 miles, the lake was situated at 3,010 feet above sea level. Considering the size of the property to be cleared and the equipment at that time, it was indeed a serious undertaking begun in 1902. The Inn opened in 1903. It was during this time many prominent families came, stayed and enjoyed the cool mountains and pristine waters of the streams that fed beautiful Lake Toxaway and the Toxaway Inn. In 1903 when the inn opened it attracted the likes of Harvey Firestone, Henry Ford, Thomas Edison, E.M. Backus, George Vanderbuilt, Henry Flagler as well as many other prominent families from that era. The Inn was magnificent. With electricity and running water in every room and the finest chefs from Europe preparing world class food, the Toxaway Inn was considered "The Switzerland of the Americas.” With trains running daily from Asheville the Toxaway Inn flourished. During the week hunting and fishing excursions were executed with local guides that were followed by lavish weekend parties that featured many of the foods from that week’s fish and hunts. The guests spent their days cruising the lake in steam powered boats and hiked the pristine mountain trails and enjoyed the cool, clean mountain air far away from the rush of city life. It was a paradise to all who came and enjoyed. Then, during the summer of 1916, the areas of Western North Carolina experienced some of the worst flooding ever to be recorded in the state’s history. On Sunday, August 13, 1916 sometime around 3:00 PM the grandeur of Lake Toxaway and the Toxaway Inn came to a sudden end. After a summer of ground saturating heavy rains that were followed by another round of major rainfall (some say as much as 30 inches in less than 4 days) that began on August 9, the already weakened earthen dam gave way to the weight of the water and let loose of over 600 acres of impounded water. Within the twinkling of an eye Lake Toxaway ceased to be and the dream became suspended in time. From that day on the Toxaway Inn closed and the area lay dormant as a resort area until 1960. From 1916 to 1960 there were many attempts to bring Lake Toxaway back but with two World Wars, the great depression and the United States changing from a rail economy to a road economy, there never seemed to be a right environment for Lake Toxaway (and the area) to become that destination resort that it once was. Also, and unfortunately, the Toxaway Inn was torn down for its valuable miles of copper wire, windows, doors, lumber, Persian runners, and flooring. It seemed that Toxaway could never come back as it was. That was, until in 1960, the pieces of the puzzle began to come together under the great vision of Reginald Heinitsh, Sr. and an investment group of businessmen from Columbia, South Carolina. In late 1959, 9000 acres were purchased from the Crosby family for $450,000 and in 1960 work began to rebuild the broken dam and recreate the "Switzerland of the Americas” known as Lake Toxaway. A true pioneer, visionary and maverick, Heinitsh, Sr. began the arduous task of shaping the destination resort community of Lake Toxaway. With the same determination that were the hallmarks so similar to the early American entrepreneurs that enjoyed the fruits of there labors during their visits, traveling by rail car to The Toxaway Inn on Lake Toxaway some 40 years earlier, Heinitsh Sr. faced the daunting and seemingly impossible task of rebuilding the lake community from the ground up. All of this was done with the spirit of a true American entrepreneur. From its humble beginning in 1960, Heinitsh, Sr. weathered all the ups and downs that are common to successful and long- lasting land development. Mr. Heinitsh persevered through the first 20+ years on shear American, boot strap determination and a little luck. Fighting through the tumultuous times and social change of the 60’s, the uncertainty of oil and gas price fluctuations, high interest rates and the economic uncertainty of the 1970’s, with shear will and determination, Heinitsh, Sr., kept Lake Toxaway on a successful path and ready to begin the next 20 years of continued success. In the early 1980’s, Heinitsh, Sr, was joined by his oldest son Reg Heinitsh, Jr. to help grow the Lake Toxaway community into a world class resort, reminiscent of its earlier incarnation of the early 1900’s. July 15, 1985, marked the beginning of Lake Toxaway’s final ascent into a world renown resort and second home community. On that day The Greystone Inn opened its doors on the shores of Lake Toxaway. The Greystone began as a suggestion by Heinitsh, Jr., to a retired businessman from the Washington, DC area, Tim Lovelace, that he felt what a great country inn the Moltz Mansion would make. The Moltz mansion was the elegant home of Mrs. Lucy Armstrong Moltz , who purchased 40 acres in 1912, and built and elegant estate including riding stables and beautiful landscaped gardens in 1915. The home was a six- level, Swiss Revival Style mansion that survived for almost five decades, although without the lakeshore view of the once beautiful Lake Toxaway. With that suggestion, Tim Lovelace went to his wife, Booboo, and asked her what she thought of the idea. She loved it! In 1984 the Lovelaces bought the Moltz property and put together a group of investors and began to renovate the mansion to become The Greystone Inn. Once again "the Moltz Mansion” was the center piece of the casually elegant community of Lake Toxaway After a year of operation, the Lovelace’s joined forces with Reg Heinitsh, Jr., and began to expand The Greystone Inn into a perennial AAA 4 Diamond Rated Country Inn.. Interestingly, Mrs. Moltz was the only resident on the old Lake Toxaway to see the new Lake Toxaway reclaim its former glory. Mrs Moltz had been all over the world and considered Lake Toxaway and the surrounding area "the most beautiful place in the world.” This classic remnant from the past was completely refurbished and soon began to accommodate and introduce the grandeur of Lake Toxaway to people from all over the world. 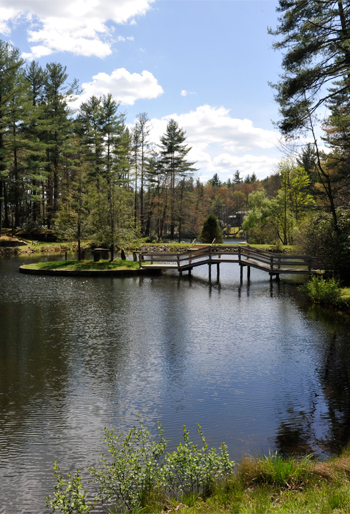 Lake Toxaway was now set to bloom into a world class resort and second home community. As The Greystone Inn opened the it doors to the visitors from all corners of America to the world, these visitors found the peace, beauty and cool pristine serenity as alluring as the early visitors did in the early 1900’s. That allure turned into a desire for people and their families to own their own slice of heaven in Lake Toxaway. A strong base of generational second family homes and property owners that became part of Lake Toxaway in the 1960’s to the 2000’s brought in people from all over the world to now make up the "Crown Jewel of Western North Carolina.” Lake Toxaway is now a 5000- acre amenity community on the largest private lake in North Carolina that features homes and properties on the pristine shores of Lake Toxaway, the 18 hole Championship Golf Course and on the high elevations and spectacular view properties high atop Toxaway Mountain. In the 1980’s, around the time The Greystone Inn was opened The Lake Toxaway Country Club added two new buildings which offered casual dining and a golf pro shop on one side and fine dining and special event areas on the other side. A full service Marina takes care of all of the lakes boating needs. In the early 2000’s the Lake Toxaway Country Club opened a Tom Fazio Designed Golf Learning Center and Fitness Club that was centered in the Bear Wallow Springs neighborhood of Lake Toxaway. As Lake Toxaway began to grow, The Heinitsh Family opened up the high mountain elevation properties that strategically surrounded and over looked the beauty of Lake Toxaway, as well as 70 to 80 mile views of the Blue Ridge Mountains of Georgia, South Carolina, and North Carolina. In addition, over the next 20 years into the early 2000’s, the original land plan of 2500 lots over 5000 acres was reduced to a more population friendly land plan with a lower density of approximately 1100 lots. This idea was shaped by the development company and agents and staff that operated under the auspices of Heinitsh, Jr. It became apparent that the upper mountain areas were more suited to larger acreage tracts of land. Thus were born the "Camps of Lake Toxaway”. These five, ten and 20 acre parcels of land, allowed to be subdivided one time, would give the owner great privacy and protect the view shed from the lower levels on the lake. The mountains would remain pristine with very little impact on the surrounding forests. Eventually, with about 2000 acres left to develop, the Heinitsh family began offering large tracts of land for sale with the idea that much of the property would be put into conservation easements. This presented an opportunity to continue to keep the land private and prevent over-development in the future. Today Lake Toxaway is now fully developed with all of the common areas, lake and dam turned over to the Property Owners. In 2006, The Lake Toxaway Country Club finished a complete upgrade of its golf course. 18 holes of championship designed by the world renowned Kris Spence along with the installation of a championship croquet lawn. Lake Toxaway offers one of the most unique resort communities anywhere in the world.